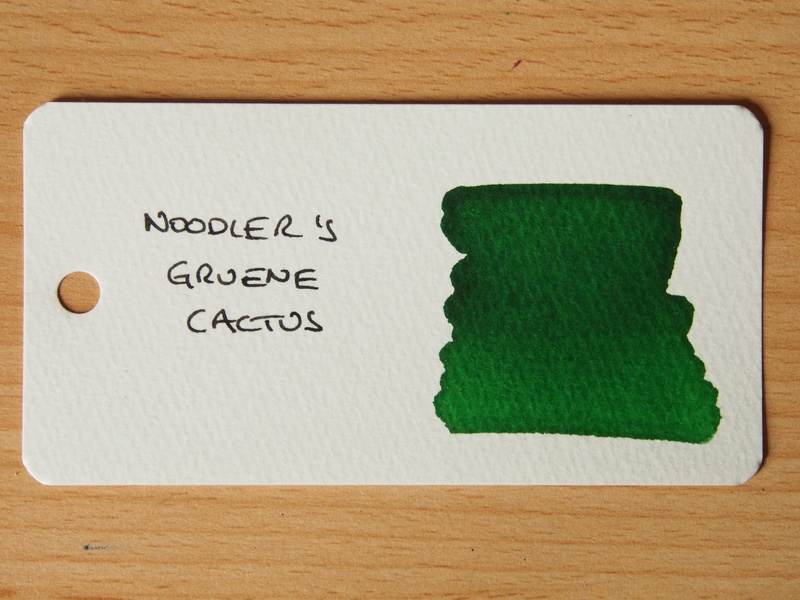 The third in this set of ink reviews is for Noodler’s Gruene Cactus, which is a green ink, in more ways than one, much to my confusion. 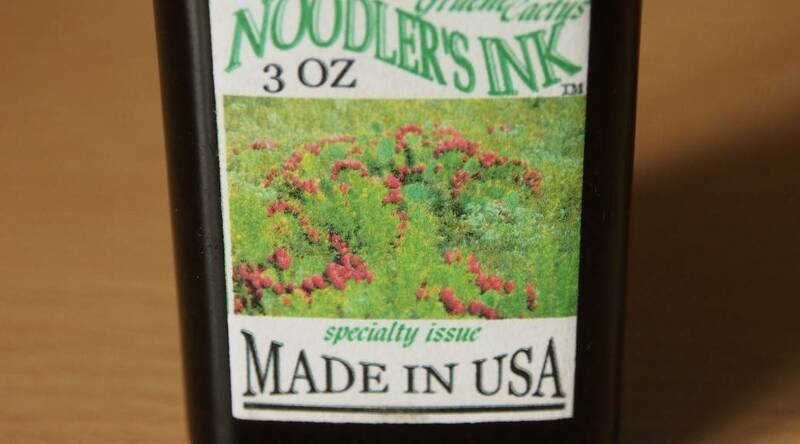 There is nothing on the Noodler’s website giving any background information about Noodler’s Gruene Cactus. Googling “gruene cactus” just gives loads of links to reviews and websites stocking Noodler’s Gruene Cactus ink. 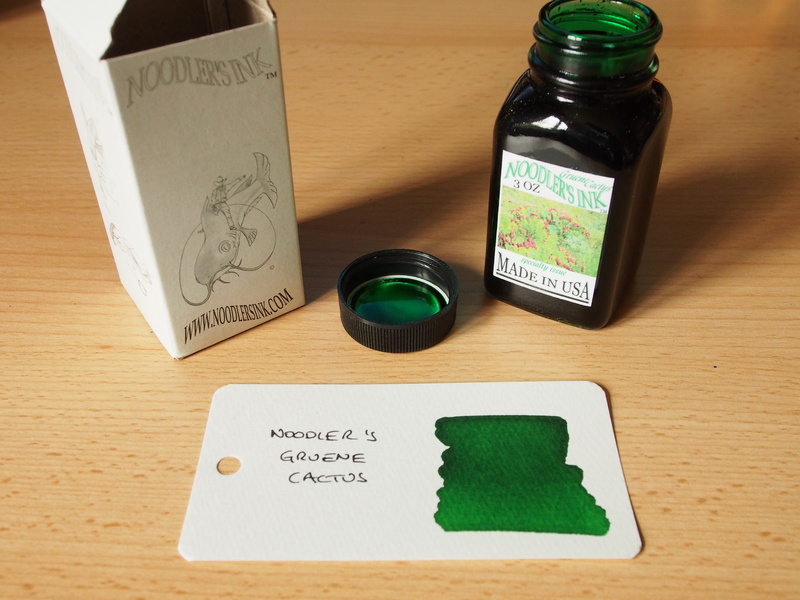 “Gruene” is German for “Green” and it’s pronounced, er, “Green”. There’s also a district in Texas called Gruene where prickly pears are commonly used in landscaping. So is it called Gruene because Opuntias are green? Of course not – Gruene was founded by a man called Gruene. All I do know is there’s a fuzzy picture of a prickly pear on the label, so “Gruene” could refer to the colour or the place. My brain is starting to hurt. 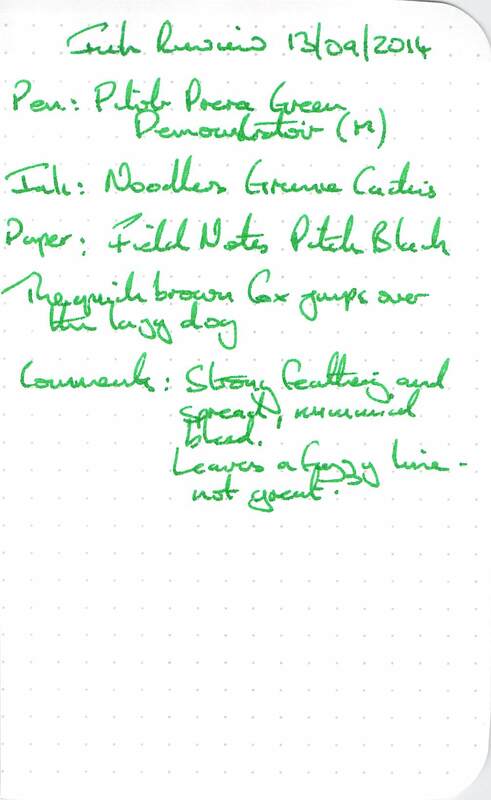 The liquid ink reminds me of a chemistry experiment from school, dissolving chlorophyll from grass in alcohol, then separating out the different types of chlorophyll using chromatography. 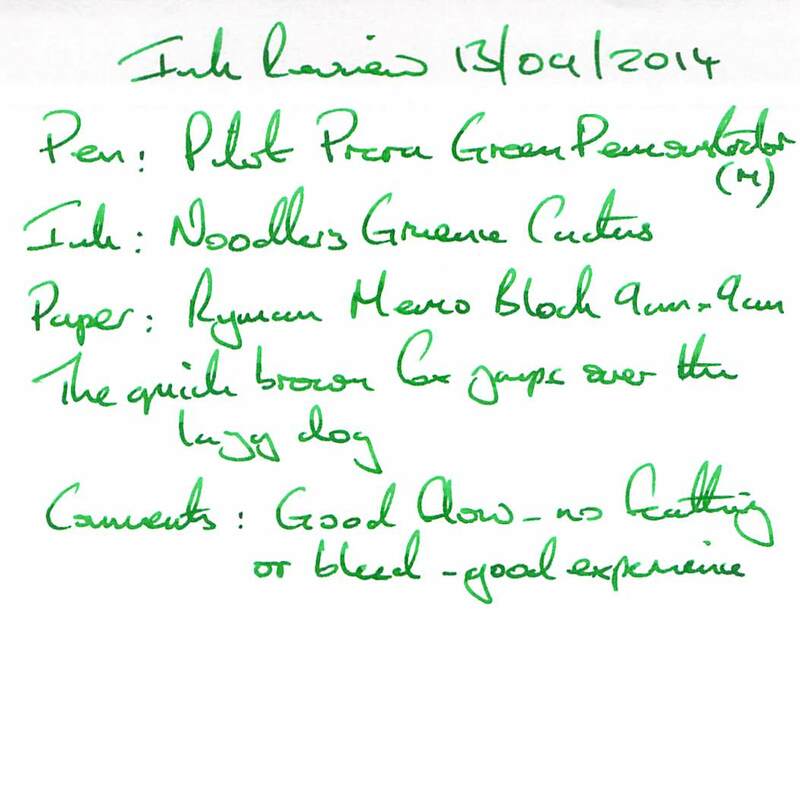 The ink looks to me exactly like the dissolved chlorophyll. The 3oz bottle wasn’t from my usual Ebay supplier, so the shipping was slightly higher than normal, but the overall cost I would still consider to be moderate. The box and bottle were as normal. 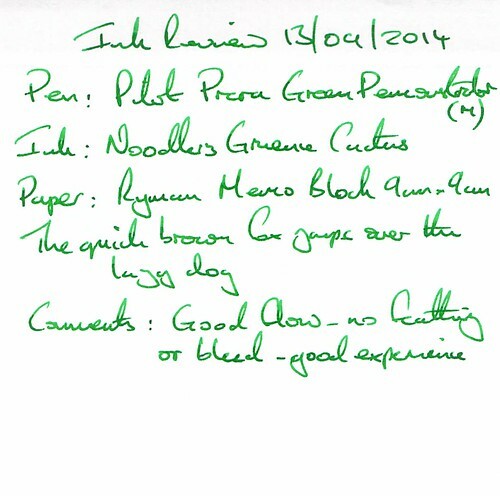 The test pen was a Pilot Prera Green Demonstrator with a medium nib, and the ink complimented the pen well. The drying time was rather long at around 1 minute 30 seconds. Cleaning was easy and the ink showed little water resistance. 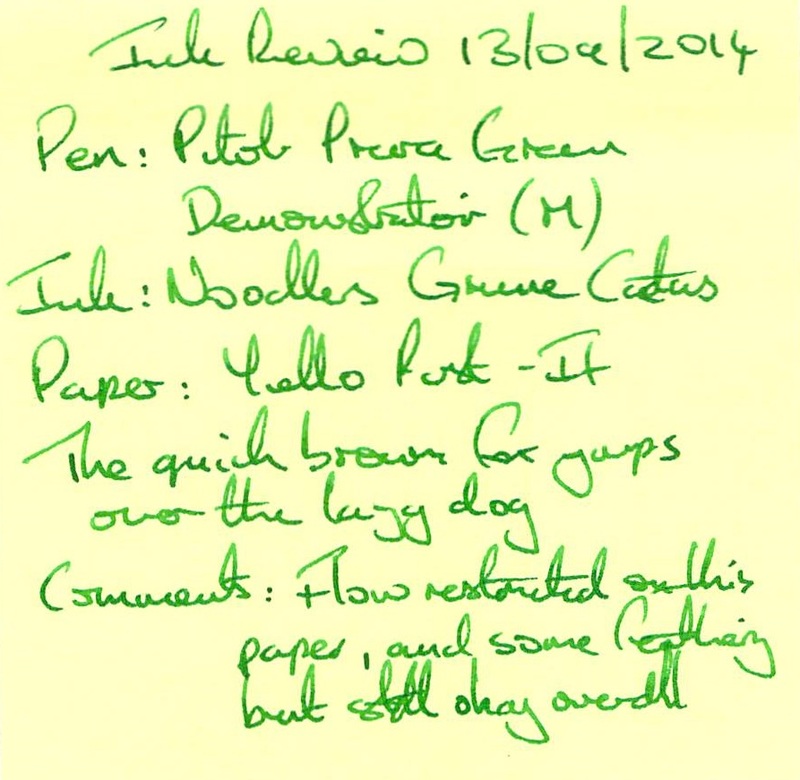 This ink gave a really nice writing experience, with some shading as an added bonus. The colour is a really nice vibrant green, with a hint of (but not too much) blue or emerald. Another good experience and attractive colour. The flow was slightly restricted and the feathering increased – otherwise the experience was still okay. Well it couldn’t last forever, and on this paper the ink feathers, bleeds, spreads and ultimately goes a bit weird. 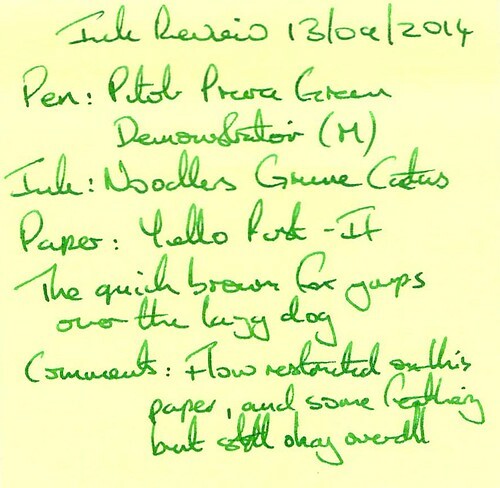 The changes of ever needing to use this ink on this paper in reality are remote anyway. Looking good, and showing a nice range of shading. 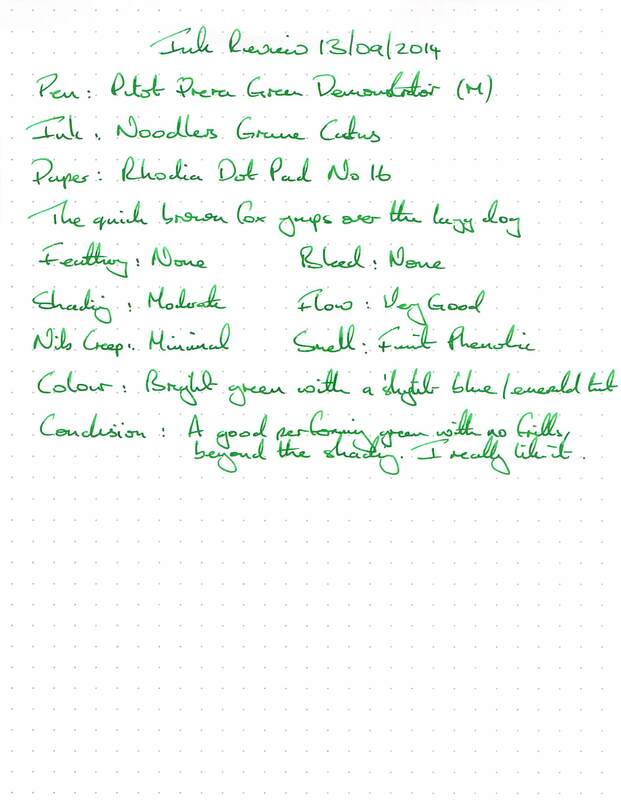 Mid green inks are limited in their application (probably restricted to markup) and it’s taken a while for me to find a few that I like – and this is one of them. Not really for general use, but if you really want your letters to stand out you could do a lot worse.